Though the water chemistry in Lakes Victoria, Malawi, and Tanganyika is different, Rift Lake Chemie provides a good basis in which cichlids and other fishes endemic to the distinct lakes may be successfully maintained. This is because it is formulated to provide the major elements in ratios derived from extensive water analysis surveys; it is therefore possible to maintain a mixed-cichlid community with water that has been prepared with Rift Lake Chemie. 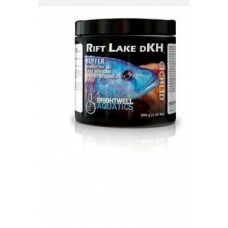 This supplement does not increase alkalinity, nor does it contain minor or trace elements important to long-term health and coloration of cichlids and their allies; used as directed, Brightwell Aquatics Rift Lake dKH and CichlidCode will accomplish these tasks. Do not add this product directly to an aquarium without first diluting in water as directed. Basic Instructions and Guidelines: Dissolve 2 grams (~½ teaspoon) of product per 20 US-gallons of aquarium water in 8-fl. oz. of fresh water; add this solution to aquarium to establish proper water chemistry and when performing water changes. Advanced Instructions and Guidelines: Create a stock solution by dissolving 8 grams (~2 teaspoons) of Rift Lake Chemie in 8-fl. oz. of fresh water (preferably purified); each ml of stock sol’n will increase the total dissolved solids (TDS) in 1 US-gallon (3.785 L) of water by ~13.7 ppm or ~0.12 dGH. [Reference: Each g of Rift Lake Chemie will increase the TDS in 1 US-gallon (3.785 L) of water by 428.7 ppm.] If initial TDS in aquarium is below desired level, add stock sol’n at maximum rate of 10 ml per 20 US-gallons daily until desired TDS is attained, then dose as needed and add to purified water when performing water changes. Maintain TDS within a range of +/-20 ppm. A sensible starting point when maintaining specific rift lake biotopes is to use the following TDS guidelines: Lake Victoria: 75 - 125 ppm; Lake Malawi: 150 - 200 ppm; Lake Tanganyika: 425 - 475 ppm.